Was Santa good to you??? weather here is bit grey, not really cold, but boring weather. We have temperatures around 6-8C, so not all too bad. Our Christmas was wonderful! First want to thank everybody for their good wishes, you are all so kind to me! Santa was very good to us, we had lots of presents and we loved them. One particular one gave me a big smile on the face, it was send all the way from the U.S.A. and it was a windchime in the form of a windmill! t is sooo adorable! I will make a photo of it when I found the right place for it in the garden. We were really spoiled and it brought a warm feeling into our heart. Dinner I made also came out good, there was enough of it for two days( I always seem to make more than really needed, LOL). We enjoyed wsatching some great shows on tv, but my absolute favourite(of course) was on Saturday before Christmas. it was the Strictly come dancing Christmas special on the BBC. It is such a shame that it is over for this season, I will have to wait a long time into next year to watch the next one. But okay, there are other things to watch and that will be almost as good. Yesterday I had my friend Heidi on the phone for just a moment, but it seems that her operation went well and she already was on the way home. I will leave her in peace the coming days, but surely will pay her a visit somewhere next week, in the new year. I am already happy to know, that for know she is doing well. Can you believe it that in a few days we already are starting a brand new year??? Gosh, it looks as if it flew away again in a second. I think I say that every year, but really, looking back, it seems it has been so short! Think I have all in the house for New Year's Eve. If possible I want to avoid going shopping on Monday , probably the shops will be crowded. We will stay home, nice and warm, and at midnight we will watch a bit the fireworks in the neighbourhood from our window. And then "normal"life will start again. In January Jan and I both will have our birthdays, we will be 66!! In the head I don;t feel like it, but sometimes my body says something different LOL! 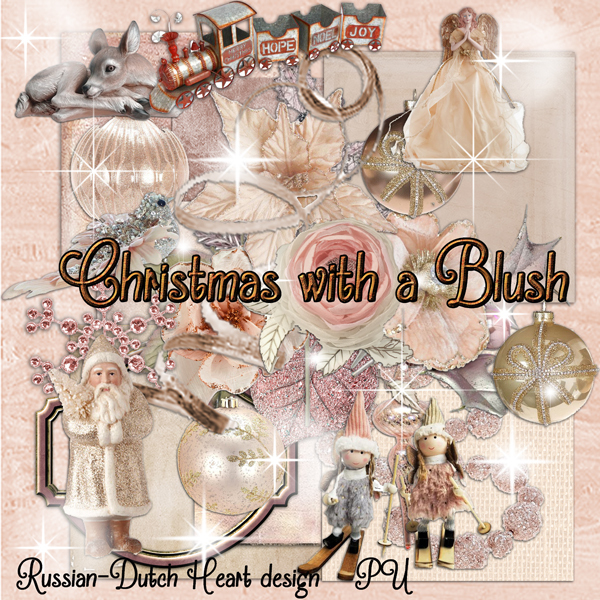 I have one more Christmaskit to share, named it Christmas with a Blush. I also put Arlene's clusters for download with it. Now I want to wsh you a fantastic New Year´s Eve and a very good start of the New Year. We have rather mild weather for this time of year. Last couple of days we had temperatures of around 11-12C, okay, with some rain here and there, but still not cold. The coming days temperatures will drop a little bit to around 5-6C, but with practically no rain and very little wind. So no white Christmas here(and I don;t mind it too much at all). I had the prescription from my doctor for a Gastroscopie, I could pick it up last Monday. So rigth away I phoned to the hospital for an appointment. Oh my, seems to be very busy there, I couldn;t get one earlier than on the 8th of February!. If I opted for another hospital there was may be a possibility to have one somewhat earlier, but the hospital is not close, takes a long voyage with the tram and isn;t practical at all. so I opted for the one in my "own"hospital. Okay, I still have every now and then some trouble with the tummy, and it isn;t nice, but I can live with it. So we just will have to be a bit more careful with the things I eat(not too spicy, not too much coffee, those things already help). If things get really much worse I always can call my doctor and then perhaps I can go earlier. Just let's hope that won;t be necessary. I just want to know what is causing this trouble, and hopefully there will be a solution for it. On to more lighter and nicer things. I have I think all in the house now for Christmas and Christmas dinner and the days before and after too. I did it in batches and it wasn't stressing I must say. during my visits into town city(mostly just to relax) I stumbled upon a few things that I bought for Jan as Christmas present. I know, we long time ago already agreed not to buy presents for eachother, but once in a whbile I cannot resist it ROFL. They aren;t expensive, but nice and practical too. Not telling now what, you never know who reads the blog, hmmmmm? Got a phonecall from Heidi, who invited us for a drink on Boxing Day. We agreed, so we will be there around 3 o'clock afternoon. Think it will be till may be 5 and then we go home again and have our dinner nice and quiet. It is sweet she is doing this. I will make her a batch of stew pears, I know she likes them. Then the day after she will have to go to hospital for her heartoperation, the repair on a vain around her heart. They must burn that little vain away, so to speak, because it is causing a to high blood pressure for her. The operation goes through her groin, so not too straining, but she still will have to stay a day there, just for check and security. If all goes well, she can be home again on Friday. Let's cross fingers and pray that all goes well. f course she will have to recover a little bit from it, so if possible(and with her it is very difficult to achive hahaha, I know her!!!! )she will have to take it easy for a month or better two. We will see if she can force herself to do it! When I will have finished this post i will pop into the kitchen, first to prepare a little bit for today's dinner, but also already prepare a little bit for tomorrow, Christmas Eve. I will make a potatoe salad with slices of smoked salmon, yummie! so I will cut now already the ingredients for the salad, and boil the potatoes. Then if we are may be a bit hungry later on, I have some really nice salami and a piece of french Camembert cheese, with some rustique bread pieces. 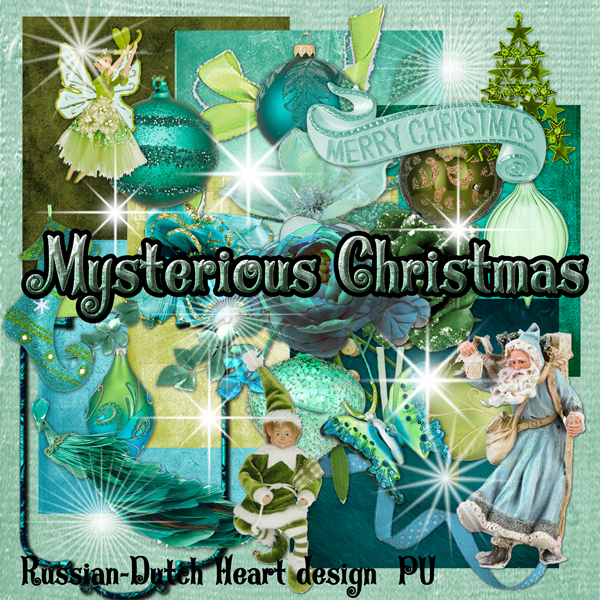 well, Christmasday you know already we will have rabbit, with home made apple sauce and potato croquettes. Oh for starter we will have a small cup of mushroom soup(I will add lots of fresh mushrooms to it) and desert will be Tiramisu. Think, it will be a yummie dinner. Then if we like to have a little bite, I have some more french cheese with some toast or bread. Next day it will be very easy. We will just have the left overs, and I expect there to be more than enough of it. But first Jan and I can finally open ur presnets under the Christmastree. I think it will be around 4.00 o'clock in the afernoon, with all the lights on and cozy and warm. Oh it will be sooo exciting! Good, this is it for now. 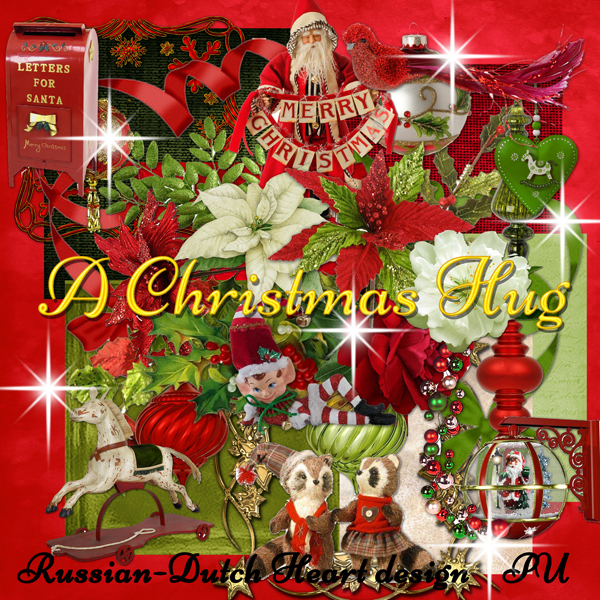 I have a Christmas kit for you in more traditional colours, named it A Christmas Hug, together with Arlene;s clusters. Last thing to do is wishing you all a Merry Christmas!!! Yes, I am a day early, but I have kind of a "day off " today, and thought it might be a good idea to do the blogpost now. That day off means I am not doing grocerie shopping, or laundry, or vacuum cleaning or whatever, just take it real easy and enjoy doing that LOL! The last couple of days we had rather cold temperatures, daytime not much more than 2-4 C and at night a bit of frost. Lucky there wasn;t too much wind. But as from tomorrow it should change again and temperatures should go up to around 7C and no frost at night. Lovely! 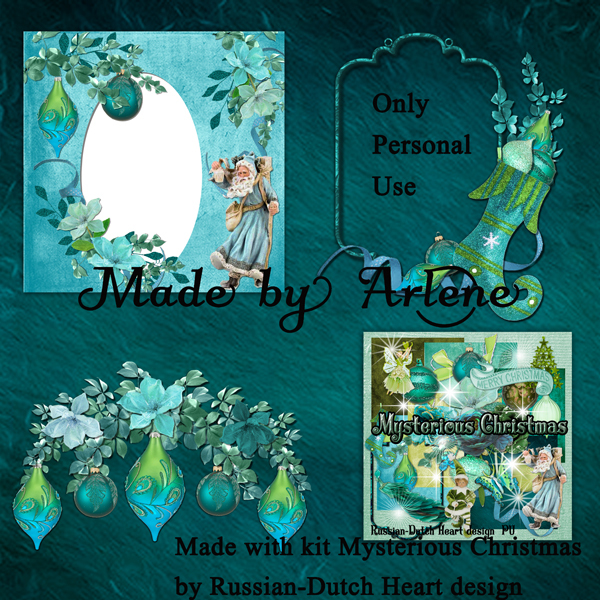 Before I forget, I got one comment on last week's post, that the link at Arlene's clusters would lead to the download link of the whole kit? I tried the link and I got just the link for Arlene's clusters. If there still problems with that, please let me know, so that I can change it if necessary. Last week was a more or less quiet week, I did some more grocerie shopping, got already lots of things I need for Christmas dinner and Christmas Eve and Boxing day, so I am almost ready with that. Of course there are also the usual things you need to get, like fresh milk, and such. Then I went back to the doctor, because the medicine drink he gave me, is helping , but not enough to my liking, So I will get a referral letter for the hospital to have an endoscopie (earlier than was planned by the hospital). I can pick it up on Monday and then i will have to make a phonecall for an appointment. Hopefully it will not take too much time before they can plan me in. For now I will hold on, it isn;t too bad, just at some moments it plays tricks with me a bit. Oh well, I surely will survive, don;t worry! I had a phonecall with my friend Heidi, all seems to go opkay with her at the moment. As usual she is far too busy for her own good, but that's how she is. Sometimes she can take it more easy, but their lives seems so busy(or may be they are making it also a bit too busy), not really enough time for all. Still I am glad she is doing as well as canbe at the moment. she told me she will have a small bunch of people over with Christmasday, and they will stay for dinner too! Now she is making all kind of little snacks, warm and cold, so everyone can pick what they like. It is much less straining than cooking the whole dinner herself. Lots of things she can pick up in the shop, ready made, so that is easy for her. I am happy that Jan and I are just together at Christmas. Sounds perhaps not nice, but we had our share of Christmasdays surrounded by lots of people, me cooking dinner for about 10-12 people and such. Now it is rather nice to be together, have a nice and tasty meal and be able to do whatever you want and watch some great Christmasshow at tv. Sounds perhaps boring, but I like it a lot this way, these days. Perhaps it means we are getting somewhat old, hahaha. Oh my, the day before yesterday I had a not so nice thing happening to me. I was out to do some grocerie shopping, just a few things, had to get me some money with my bankcard, that was okay, then after the shopping I realized it should have taking just a little bit more in cash, so I went for another bit of cash at the ATM, and i got the message:"there is an error occuring, contact your bank"
Oh no, I thought, just now perhaps my bankcard has a scratch or so, that prevents it from working correctly. Hm, so i decided to go to the bank to be sure. Arriving there, the guy who helped me(very nice man, I must say)told me that there was no need to be concerned about my card. I just took money from a "guest ATM" (one from another bank) and you can only do that one time a day. If I should do it at one of my own bank, there should be no problem. I tried it out there and oh relief, the card worked well.! so I made the journey to the bank somewhat for nothing(because I already thought it might be as the guy told me, but I wasn;t sure), but I didn;t care, now I knew there was nothing wrong with my card. I would have been very unpleasant not having my card, specially these days, when you seem to use it more than usual. Just looking out of the window now and it looks rather nice outside. At least, the sun is shoning, there even is some blue sky, but looking at the people that walk along the street, it still must be rather cold. Time to take a bite now and something to drink. 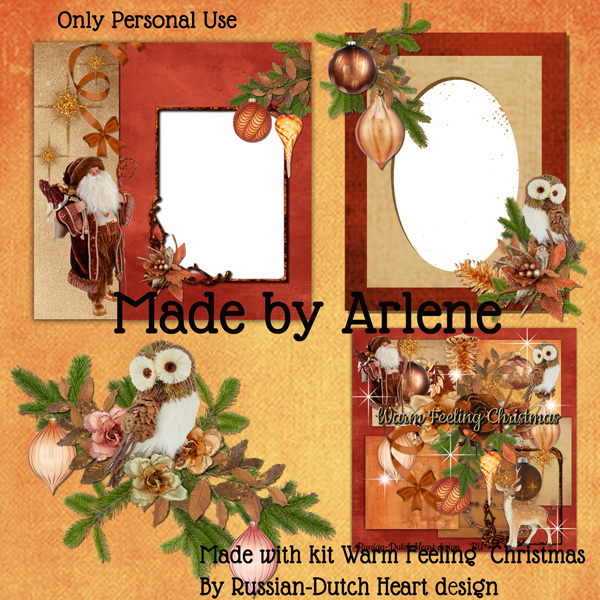 I have for you another Christmas kit, together with the clusters Arlene made. Christmas already arrived in our home! Yes, a bit late, because I woke up a little bit later, then slowly woke up, then Jan woke up too, I had a little breakfast, then coffee together with Jan, and in the mean time we watched a recorded edition of Strictly come dancing from yesterday. It were the semi-finals, so quite exciting. Next week will be the finals and I am very curious who will be the winner, there are 3 very strong candidates for it. I surely will miss it when it is over. Weather here is kind of rainy, hard winds, sometimes a little bit of sunshine, but only for a short periode and temps slowly will go down again this week till around 4-5 C, brrrr, nor all too nice. I went to the doctor for the tummy, he gave me a drink that should calm it down a bit more, but when I still will have troubles I should come to him somewhere next week. Then he will ask for an echoscopy in the hospital. It is somewhat better, but almost every day there are short periodes that it isn't feeling as it should. I am still lucky, that for now it is just feeling uneasy but not really hurting. 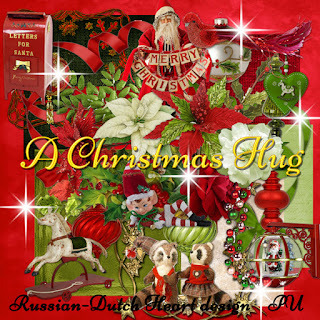 It never is the right time for it, but specially this time of year I could do without it, with Christmas coming and having to do some preparations for it etc. Last Thursday Jan and I started decorating our living room and got it almost finished that very same day. We only had to do some smaller decorating and putting on some Christmas table cloths on several little tables and so on. We both were quite "pooped out". But i was happy we did it and also good thing that our tree was standing, because on Friday evening the postmas brought a package from my friend Edna. I unpacked the box and put all the presents under the tree. It is such a happy sight! I've made a photo of the tree. Now we will have to be a good boy and girl and wait till Christmasday to unwrap it all!! Hard thing, but we will be good(and it is also part of the fun LOL). So this week has been rather busy, with doctor visit and Christmas decorating. Next week however also I will have to do some things. Specially the Christmas grocerie shopping. I want to do it earlier this week, because when I wait till friday or Saturday, I think there will be an enormous crowd in the supermarkets. (as well as in city centre for last minute Christmas present shopping). Almost all things I need can be bought in advance, so that is my plan for start of the week. Then if the tummy is still doing funny, also have to go to the doctor this week(he will be on a week holiday the week after). Time to end this post. Must look after the stew I am making for today's dinner(with lambs meat, green beans, mushrooms, onion and potatoe). 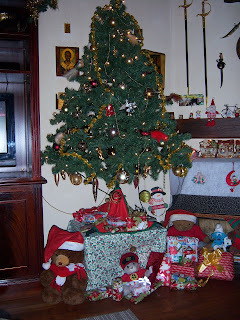 The also want to write a few Christmascars, that must send tomorrow or at last the day after. 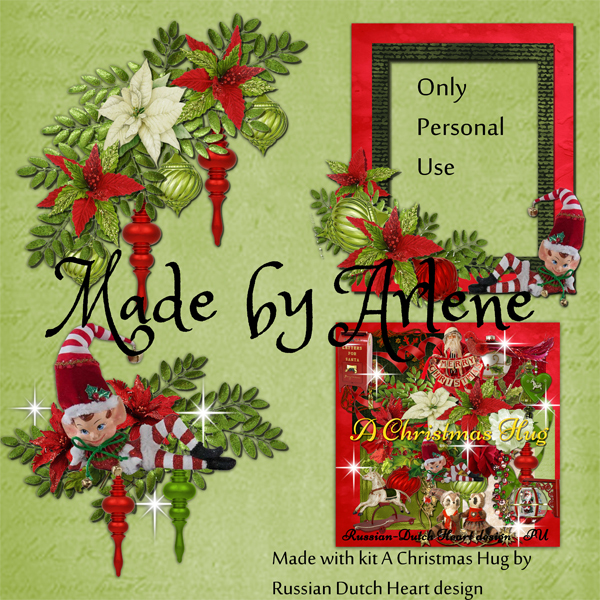 I have for you the clusters Arlene made with the Warm feeling Christmaskit. Next week there will be another Christmaskit, together with the clusters!! We had some not to bad days speaking of the weatherconditions. Temperatures are rather high, around 10-14 C, although later this week it will drop again to around 8C. But nothing is perfect, so with the higher temperatures we got more rain and also more wind. Still I am happy with the temperatures, you know that freezing and snow aren;t my favourites. I wanted to go to the doctor this week for the tummy, but i didn;t go. Start ot the week I was to late for making an appointment( you can only call for that in the morning at certain times), then one day the doctor was absent, then i felt somewhat better, so you know how it goes then, hmmmmmm? But then this weekend it started again so I really will go to the doctor this week. I had good news from my friend Edna, that she already received her Christmasbox. Oh, am so happy that I did send it early, because at the moment at the post they have millions of packages to deliver(all the on line bying is adding to that a lot, of course). They already have trouble to deliver all in time, (mostly for the Sinterklaas, Which is thie Wednesday) and then they will get the Christmas packages also after that. Doing some grocerie shopping this week I also bought some things I would need for Christmas. I like to get things in time(some fresh you will get at the last moment, but lots of other things can be stored). I bought my rabbit that i will make for Christmas, it lies in my freezer, chopped up in several pieces. Soak the plums in 1/2 bottle of dark beer. Herb rabbit parts with salt and pepper. Bake golden brown in clarified butter. chop onion and shallots. Fry the bacon strips too. Pour in the rest of the beer and let it cook well. Add the herbs. Add prunes and pickled onions to it. Lower the heat and simmer for approx. 1 hour with the lid on the pan, till meat is soft. You can serve it with potato croquettes, or boiled potatoes and vegetables of your choice.I might make my own appelcompote with it, or perhaps this compote and some cranberry compote too, yummie! 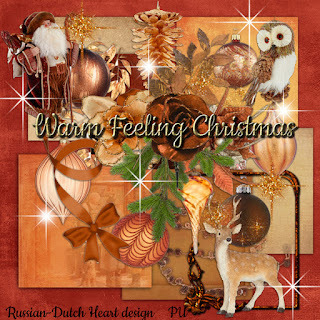 This week Jan and I will start decorating for Christmas already. If all goes according plan, i would start on Thursday(just after the Sinterklss holiday), and hopefully all will be about ready on Friday, and then we can enjoy it already during the weekend. What more did I do? 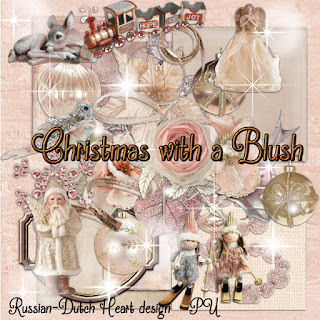 Oh yes, I took quite some "free"time to sit at the computer and make some Christmaskits. Yes, I really did! And I have finished already 3! Amazing, isn't it? I still want to make one or two more, but I don;t know if I can manage it already this week. Depends also a bit on the doctors visit and the Christmas decorating. And in between I have to do some cleaning around the house, some off the usual nature and some a bit extra because of Christmas holiday( some places in the room will be hard to reach with all the decorations and the tree and such). This week offer you the 1st Christmaskit, named it Warm Feeling Christmas. Hope you like it. Have a wonderful week ahead, enjoy the upcoming Christmas time and spirit, and stay safe!